The Greatest Comedy Team of All Time is here to poke, smack, slap and bonk their way onto your screens in one of the biggest collections ever of their work. 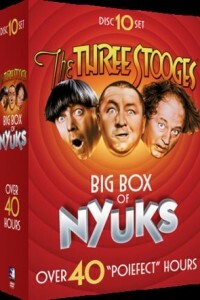 Enjoy over 40 hours of films, shorts, cartoons, and rare performances together in a big box of nyuks. Also included is the 9-part documentary series from Moe’s son Paul that goes behind-the-scenes for an in-depth look at the real people and families who made generations laugh around the globe. Packed with bonus photo galleries, unaired TV pilots, and a collector’s booklet – prepare for the Sultans of Slapstick, the Masters of Mayhem – to entertain and amaze with this library of their work spanning from the 1930s through 1970.